As it turns out, wild rabbits want the same things in a garden that you do… flowers and veggies! After all the work involved in planting and tending to your garden and landscaping, it can be disheartening to find your precious flowers and vegetables nibbled away by wild rabbits. But conflicts with wild rabbits are not all one-sided. Raking and mowing often disrupts their nests. Cats who are allowed to free-roam catch and kill baby rabbits. When people find baby rabbits alone, they mistakenly assume that the babies are orphaned, and take them away from their mother. 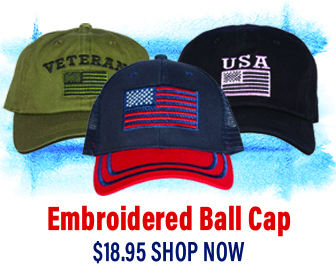 Read on for easy preventions and solutions for these dilemmas! 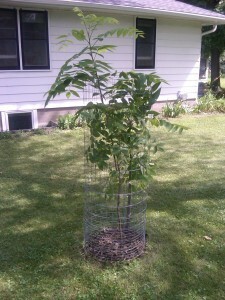 Wrapping wire around young trees will prevent rabbits from dining on the delicate bark. Wild rabbits love yards, parks, and playgrounds because the brushy edges provide cover while the open areas provide ideal foraging. 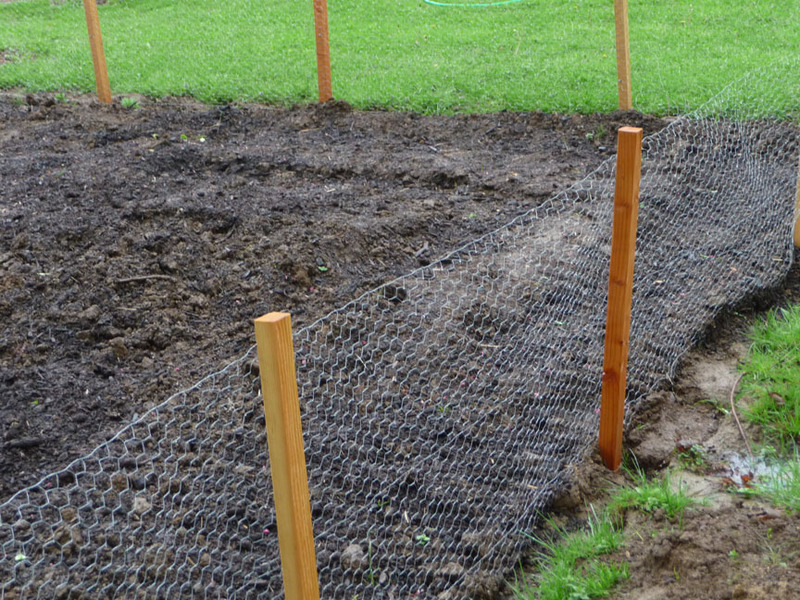 Protect your garden by surrounding it with a 3 -foot-high chicken wire fence (or similar) with support posts placed every 6-8 feet and landscape staples securing the bottom edge to the ground. Use a repellent recommended by your local garden store and apply it diligently –every 2 weeks and after any heavy rain. Do not use repellants containing predator urine since the urine is obtained though inhumane sources like fur farms. Protect trees that get nibbled on in winter by wrapping the base of the tree trunks with wire mesh or chicken wire. The height of such a barrier should be 18” above the highest anticipated snowfall for your area. 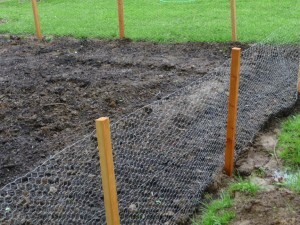 Erect a temporary silt fence until the rabbits have vacated the area. Rabbits are not inclined to jump into something from which they do not have total vision of their surroundings. Otherwise they are unable see predators. 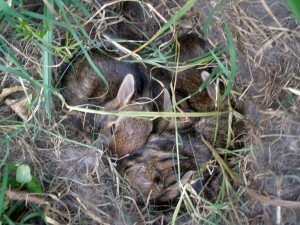 A nest of baby rabbits without a mother does not mean they are orphans. Rabbits sometimes build their nests in the middle of grassy areas, which may include your lawn! Do a careful inspection of your yard before mowing and if you find a nest, leave a wide band of grass around it for a few weeks. If you have cats, keep them inside or on a leash for the safety of young rabbits, birds, and other wildlife that nest on the ground in spring and summer, as well as for their own safety. 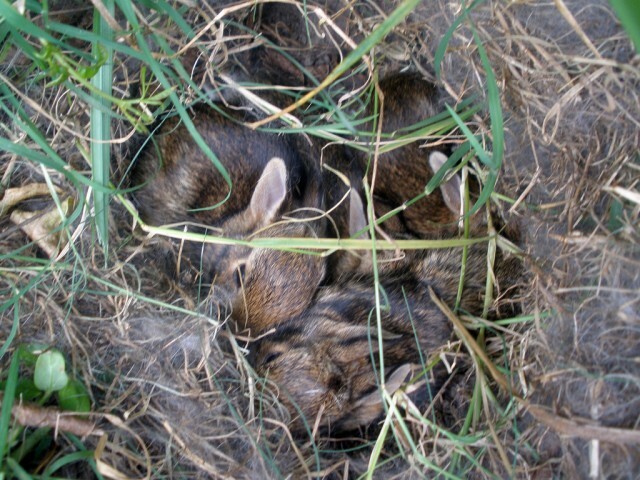 It’s normal to find a nest of baby rabbits with no mother around. She stays away from the nest to avoid attracting predators to her scent (her babies are odorless and rely on camouflage for protection). After 21 days, a baby rabbit no longer depends upon his mother, so whisking such a rabbit off to a rehabilitator is unnecessary. How can you know? If the rabbit was found in the nest, she is not independent yet. If the rabbit is fully furred, the size of a chipmunk or tennis ball, has open eyes, can hold her ears up straight, and is hopping well (and may be hard to catch), she’s ready to be on her own, so leave her alone. Rabbits can be high-strung and skittish. If you’ve disturbed the nest (or a lawnmower has), you can test to see if the mother has returned. Lay some pieces of yarn or string across the nest in the form of a “tic-tac-toe” pattern and wait for at least twelve hours. If mom has returned to feed her baby bunnies, the string will have been pushed aside. If the tic-tac-toe pattern stays perfectly in place, she has not returned and you should bring them to a wildlife rehabilitator. If a dog or cat captures a rabbit, make him drop the rabbit before it is too late. Because cats have toxic bacteria in their saliva that can cause a septic infection, do bring the rabbit to a licensed wildlife rehabilitator right away if it was in a cat’s mouth or has puncture wounds. The rabbit will need to go on antibiotics immediately. Be sure to use gloves and wash your hands after handling a wild rabbit. If you find a nest before your pets do, it is essential to keep them away from the area for 3 weeks or until the baby bunnies leave the nest. Rabbits bring wonderful wildlife viewing opportunities to your yard—a great reward for the small efforts that may be needed to keep both your plantings and their babies safe. Hey Buddy!, I found this information for you: "Yard and Garden Conflicts with Wild Rabbits". Here is the website link: https://effectivewildlifesolutions.com/conflicts-with-wild-rabbits/. Thank you.